The constellation Apus. Roll mouse over to see labels. Apus is a small constellation close to the south celestial pole. 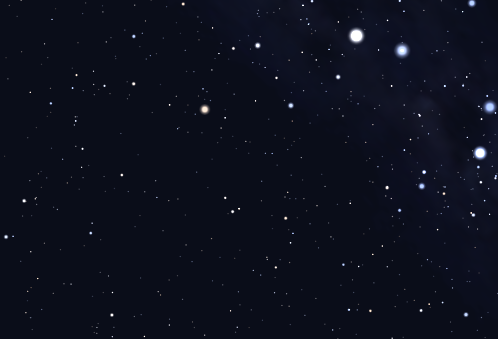 It contains only two stars brighter than fourth magnitude. It contains the globular cluster NGC 6101 and many faint galaxies, but no other deep sky objects that are easily seen. Apus represents the bird of paradise, found in New Guinea. The name was given to this sky area by Keyser & de Houtman at the end of the sixteenth century. Apus contains the following Caldwell object: C107. 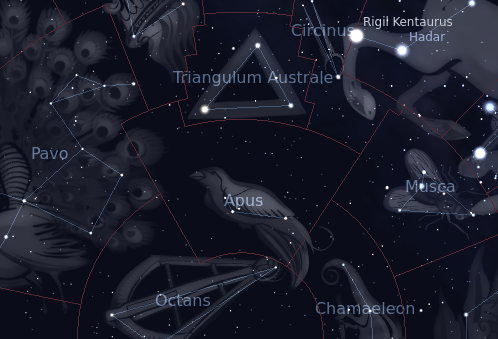 The following constellations neighbor Apus: Ara, Chamaeleon, Circinus, Musca, Octans, Pavo, Triangulum Australe.